So sweet and so spooooooky! This trifle is full of chocolate goodness with sweet meringue ghosts and white chocolate bones. It's a great Halloween treat! Spooooky thing happen around here in October. 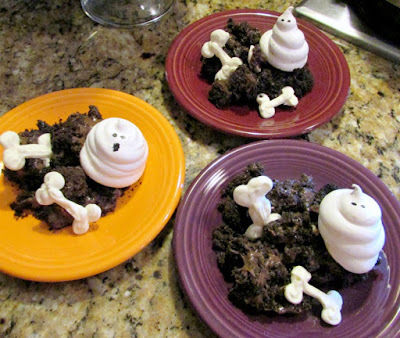 Like this chocolaty ghosts in the graveyard trifle. 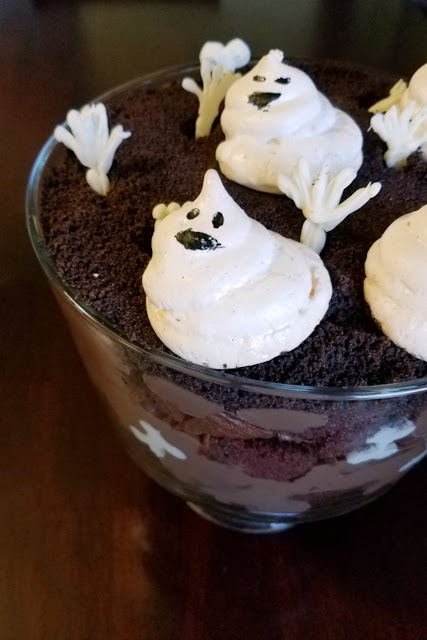 There are candy bones, chocolate cake and pudding dirt and fun meringue ghosts. This is sure to tickle your funny bone, or scare your scaredy bone... or at least tickle your tastebuds and fill your tummy. So make some if you dare! I am so excited to share this post with you! 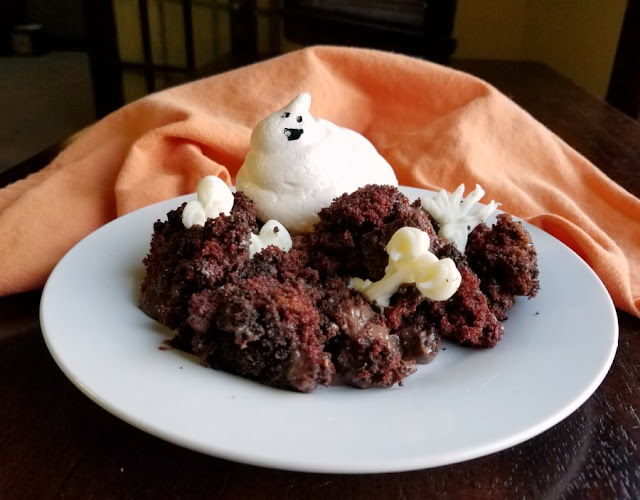 Partially because I think it is a really fun Halloween dessert, but mostly because I am also sharing some other fun Halloween ideas from some of my favorite bloggers. Fun, right?! Ok. On to dessert! This one is as delicious as it is cute. I actually made it the first year the blog was around. It was so much fun that I thought we should make it again. Of course Little Dude was happy to help. As it goes with these things, he helped every step of the way. He saw me piping out candy bones and he wanted to do some to. He helped make the cake batter and the pudding as well. When it was time to plant some of those bones in the graveyard, of course he helped with that too. 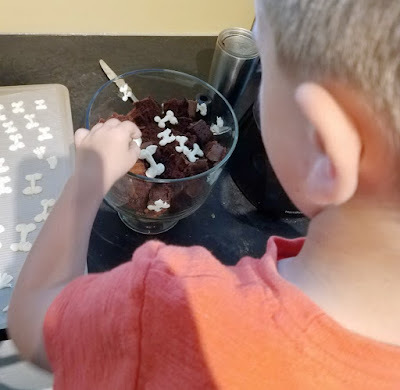 He thought it was so fun that there were bones in our chocolate "dirt." Almost as fun as putting faces on our meringue ghosts! I brought it to a family dinner at MiMi's house. My husband had to hold it for the drive so it would tip over and he was practically drooling on it as we drove. He helped himself to seconds the night we had it and then ate some of the leftovers the next day. For my meat eating husband who would almost always prefer another helping of dinner rather than save room for dessert, that is really saying something. He wasn't the only one that enjoyed it. My new sister-in-law didn't get to enjoy the original version, so she thought it was so fun... I mean freaky! The devilishly good chocolate cake and the deep chocolate pudding were the perfect mix. It wasn't super sweet, just the right balance of sweet and dark chocolate. If you want your trifle to be a little darker in color, you could always add a couple of drops of black food gel to the pudding and cake. I considered it, but decided against it. I made sure to serve each helping with a ghost and some bones. Everyone was quite happy to partake in this ghastly treat!! This is a great make ahead dessert for an October dinner party. The individual pieces can all be made as far as a couple of days in advance. You can assemble the trifle (all but the ghosts) ahead of time too. All you have to do to serve is place a few ghosts and let people dig in! 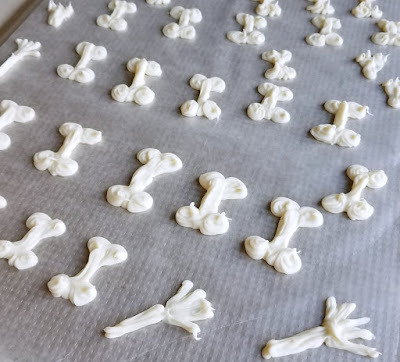 Melt the white chocolate chips and place in piping bag or small plastic bag. Cut a small hole in the corner of the bag. 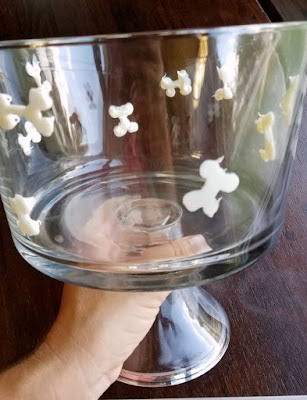 Pipe a few bone shapes onto the side of your trifle bowl. You want to make sure some will be visible before you serve it. Pipe the rest into bone shapes on wax paper. Refrigerate bowl and extra bones until set. Cut the cake into small cubes. Layer half of them on the bottom of the trifle bowl. Scatter a few bones on the cake layer. Top with half of the pudding. Repeat these layers. Spread the cookie crumbs over the top layer of pudding. Refrigerate until ready to serve. 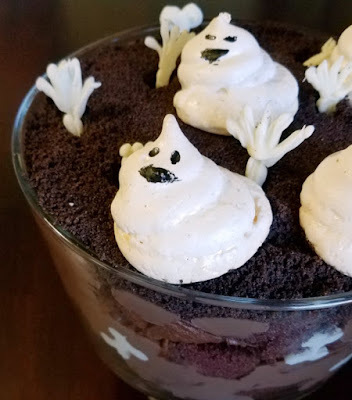 Immediately before serving, place a couple of meringue ghosts on top of the trifle and stick a few bones so they are showing through the "dirt." Serve each helping with a ghost and a couple of bones. Eek! My favorite Halloween treat is chili or soup but you probably want to know my favorite sweet. It wot have to be jack o lantern cookies. There are so many happy memories attached. Those are a good one, that is for sure! This Ghosts in the Graveyard Trifles so cute. Kids would love this. It would be a great addition to a Halloween party. Thank you! We really enjoyed making (and eating) it! Although it may be too cold for this around Halloween, I could sure go for some of MiMi's homemade candy bar ice cream with the leftover Halloween candy! I love anything Reese's as far as Halloween candy goes. Love chili and soups with cornbread....yum! I'll definitely have to make these meringue ghosts..I love making meringues. Great giveaway, thank you! I'm with you on all of these things! I love soup/chili season and Reese's candy off all kinds are my favorite. Right now I'm on a bit of a Reese's Pieces bender! Thanks so much for stopping by! I love sugar cookies too! Yum! This is so adorable that it made me giggle and it looks delicious! I'd love for you to share this at our party, Wake Up Wednesday! Thank you! It was a lot of fun to make and eat! I will stop by soon! Your trifle is seriously the cutest ever, really nice job! Reeses peanut butter cups are my favorite halloween treat! It is hard to go wrong with Reese's! Butterfingers, or Reese's. Or apples. Or anything caramel. Or... oh lets just say anything Halloween is my favorite! Lol! Me too. Any sweet treat that is available is my favorite! My favorite Halloween treat is anything with peanut butter! 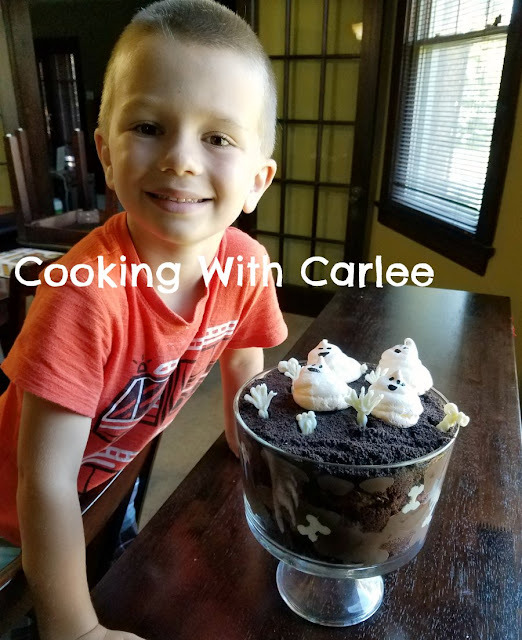 A fun dessert for Halloween Carlee. Thanks for sharing at #WednesdaysWisdom. OH what a fun Halloween dessert. Love anything that looks like a graveyard and is tasty heh. We thought it was fun too! Nothing like some ghosts and bones in your dessert! This is such a cute Halloween dessert! It's perfect for kids. Thanks so much for sharing at Inspiration Thursday! It is a fun one, that is for sure! Thanks for hosting! This is so cute and sounds so good, perfect for Halloween! Thanks for sharing at What'd You Do This Weekend?! Thank you, we really enjoyed making and eating it! I hope you are having a great weekend, see you Monday morning! Love it ! So cute presentation of ghosts in graveyard :) Thank you for sharing with us at #HomeMattersParty . We would love to have you again next week. Thank you so much for hosting, see you next week! Oh my gosh! This is such a cute idea!! Love it! A great idea for a Graveyard Trifle! Hope you are having a great weekend and thanks so much for sharing with Full Plate Thursday. Thank you! It was spooky and delicious too! great recipe for Halloween - Thanks for linking up to Pin Worthy Wednesday, I have pinned your post to the Pin Worthy Wednesday Pinterest Board. Thank you so much! We have been having fun making Halloween recipes. I love, love love this! I'd be thrilled if you'd share it with us over at Country Fair Blog Party, which is a once a month link up! I love the Country Fair Blog Party! Thanks so much for stopping by! What a fun trifle. My hubby is a party pooper when it comes to Halloween. My favorite treat is candy corn. Candy corn is always fun this time of year! I am really tempted to try to make some homemade this year. For candybars I love Butterfinger. For Halloween treats I'll take some fun sugar cookies decorated Halloween style! Ooh, I'll take one of each please. Those are two of my favorites as well! Favorite Halloween treat is what I call "crack snack" because it is so addictive. A mixture of Chex cereals, popcorn, pretzels, nuts coated with a sweet and salty caramel sauce, microwaved until crisp. When dry, mix with candy corn and fall colored M & M's. 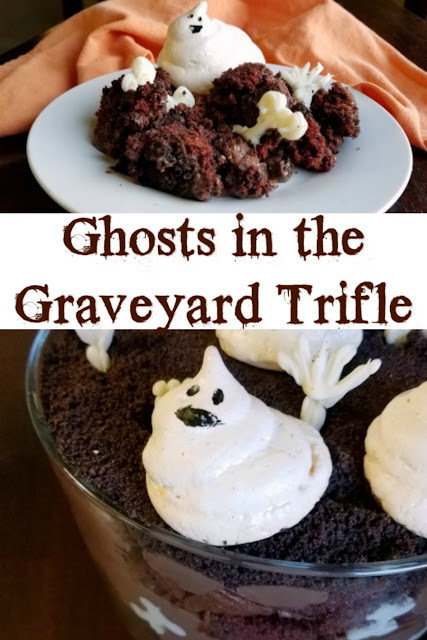 Your Ghost in the Graveyard Trifle is just such a cute idea. Thank you for sharing with the Clever Chicks Blog Hop! I hope you’ll join us again next week! Thank you, I'll see you Sunday night for sure! This has to be the coolest dessert ever! Thank you so much for sharing :). I really think it is so awesome! I can see why your husband had extra helpings! These other ideas look great too. Thanks for sharing with the #BlogFair, hope you can visit again this week. This looks delicious! So moist and I love those ghosts on top. Love your creativity! Thank you for sharing at the 2016 Halloween Blog Hop. It is definitely a tasty bite and just a bit spooooooky. Thanks for hosting! Oh my gosh this is absolutely adorable! What fun for Halloween. Thank you! It is fun and delicious! What an awesome dessert and so appropriate for Halloween. Yummy! Thank you! It is a fun one, that is for sure! What a great Halloween recipe! Meringue ghosts are just darling! Thank you! It was a fun one, that is for sure! OMG Carlee this is SO super adorable! My kids will LOVE it. My teen has an October birthday so we always have spooky treats. How fun! My husband has an October birthday as well and he loves the spooky treats and all things Halloween. That is a great idea! Getting to eat a whole one is always so much more fun too! I love this! What a fun treat! Thanks for sharing at the Halloween Link Party. Pinning. Always so much fun to have your little goblin helping in the kitchen. What a fun dessert. I'm sure it was spookily delicious. Isn't it fun to have little helpers? It is eerily good for sure! I love those little bones! This would certainly be a fun change from a traditional Halloween birthday cake for my husband. You should totally do this for his birthday cake! So cute and when the little ones help it's so much more fun! He had a great time helping! This will be super fun to make with my niece! Any kids would LOVE this! Heck, I love it. It's just so good to the "bone!" LOL! Too stinking cute. I bet the kiddos had a blast decorating it with you. Thank you! We both had a great time doing it! Your Ghosts In The Graveyard just adorable and looks delicious! Thanks so much for sharing with Full Plate Thursday and have a great week! It's a fun one to serve and so delicious too! Thank you! Your ghosts are so cute - or should I say scary!! !